Brad Pitt is an American film producer and actor with accolades a mile long, he is also blessed with good looks and is touted as one of the finest men in Hollywood. Brad has starred in a host of movies including the iconic Troy in 2004 where he played the role of the legendary Greek warrior, Achilles. Brad Pitt was born in Shawnee, Oklahoma on December 18, 1963. He was the eldest of three kids born to the family of Jane Etta, a school counselor and William Alvin Pitt who had a job running a truck company. His siblings are Douglas Pitt, born three years after Brad, his younger sister, Julie Neal was born three years further down the line. Brad grew up in Springfield, Missouri and he has described it as having lots of hills and lakes. His full birth name is William Bradley Pitt. Brad attended Kickapoo High School and had a host of interests in many extracurricular activities. Enrolling at the University of Missouri in 1982 after graduating from high school, Pitt majored in Journalism. Films were his thing and he left for Los Angeles to chase that dream. His breakthrough year came in 1994 when he starred in the horror film Interview with the Vampire. He earned awards for his performance in that movie and from then on, the plaudits just seemed to keep rolling in continually. A Golden Globe Award nomination came after the movie Legends of the Fall. The next movie Seven earned as much as $327 million at the international box office. When he starred in Fight Club in 1999, aside from boosting his bank balance Brad credited the movie for teaching him some life lessons as well. His most commercial movie, however, has been 2004’s Troy where he starred as Achilles. The movie was also the first film produced by Plan B Entertainment founded by Pitt two years previously alongside Jennifer Aniston and Brad Grey. Some of his more recent works include Fury in 2014 and World War Z. Here is a list of the women Brad Pitt has been with through the years. Brad dated the “Toy Boy” singer for several years during the 80’s. The couple was together on and off during this period. The divorce between Robin and boxer, Tyson was yet to be confirmed when she was seen spotted hanging out with the dashing Brad Pitt. The rumor mill went into overdrive but soon whatever they had going fizzled out. Pitt had played the boyfriend of the actress in the series, Dallas and the pair were rumored to be together. McCall, however, went on to marry someone else. 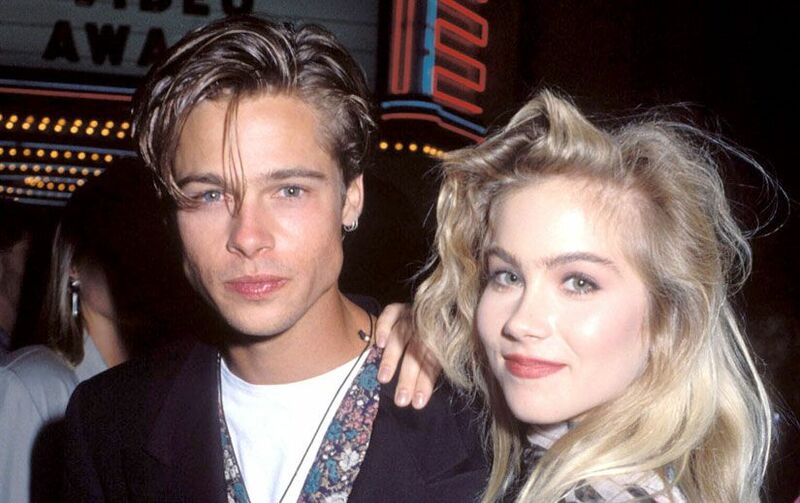 This pairing was made famous when Brad got ditched by Christina for another guy after they attended the MTV Movie Awards as a couple. Pitt and the pop singer dated briefly after a previous relationship had ended for him. The pair met on the set of the horror movie Cutting Class. Pitt had popped the question and the pair were engaged for three months before Jill ditched Brad for the director of another movie. According to Brad’s former roommate, Jason Priestly, Pitt and Geena met up in real life after working together on the movie Thelma & Louise. The relationship between this pair was brief and ended quickly but amicably. Brad met Gwyneth while filming Se7en. He proposed in 1996 but had the engagement terminated seven months later. Brad finally got to put a ring on it after his agent and that of Aniston’s had set them up on a blind date. They dated for two years, got engaged and had a wedding in Malibu that cost over $1 million. Things turned sour during the filming of Mr & Mrs. Smith as Brad and Angelina Jolie fell in love. In January of 2005, Jen and Brad got divorced after getting married in July 2001. Brad and Angelina were a couple for 12 years. During their time together, they had three kids and adopted another three internationally. The union ended in 2016 after Angelina filed for divorce. Who Is Brad Pitt Dating Now? Brad had a business that took him to MIT and there he met the esteemed professor Neri Oxman. The pair is rumored to be in a relationship; if true, they have decided to keep it clandestine.